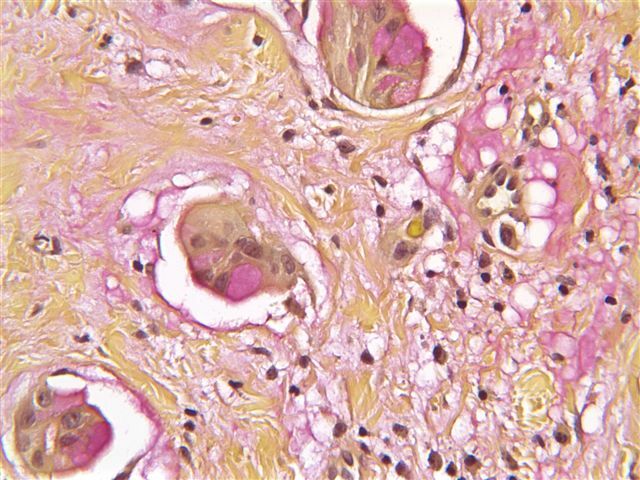 This Case is sponsored by Milestone Medical, the technological leader in Microwave Accelerated Tissue Processing. 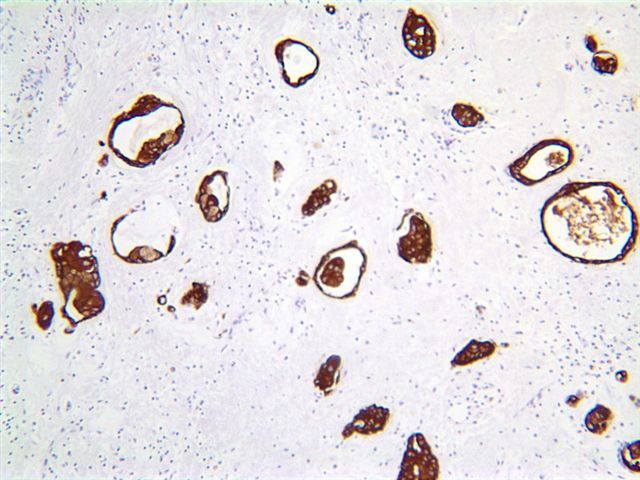 Milestone manufactures instrumentation and accessories that enable Histologists and Pathologists to achieve the highest level of productivity, while maintaining their flexibility and safety.� Milestone�s family of rapid microwave lab stations allow tissue samples to be processed in a fraction of the time as compared to conventional methods, allowing for same-day diagnosis.� They also offer a line of digital imaging equipment for grossing stations and autopsy rooms.� These systems serve as a comprehensive method of storing macroscopic images of all specimens examined in the laboratory, providing an invaluable diagnostic database for routine grossing, teaching, and research.� For more information, please visit our website by clicking here. 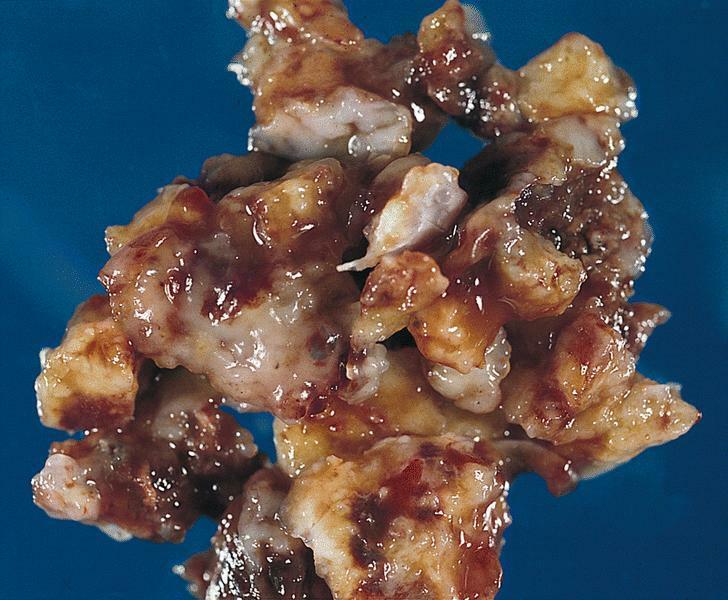 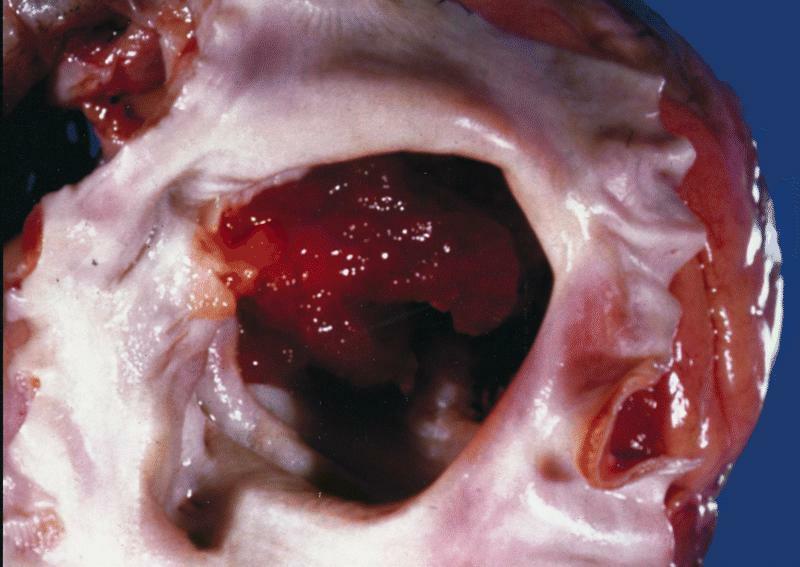 A previously healthy 65 year old woman had a left atrial mass approximately 30 cc in volume. 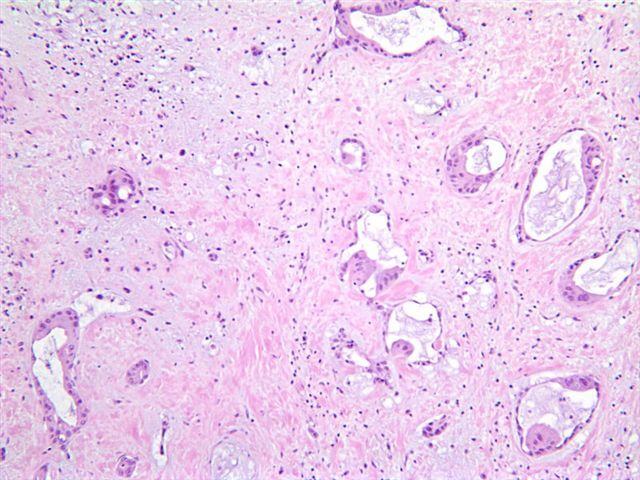 The tumor has a focal glandular component with bland columnar cells containing mucinous vacuoles.� No cytologic atypia or mitotic activity is present.� The stroma is hypocellular, edematous and myxoid, with occasional prominent blood vessels. 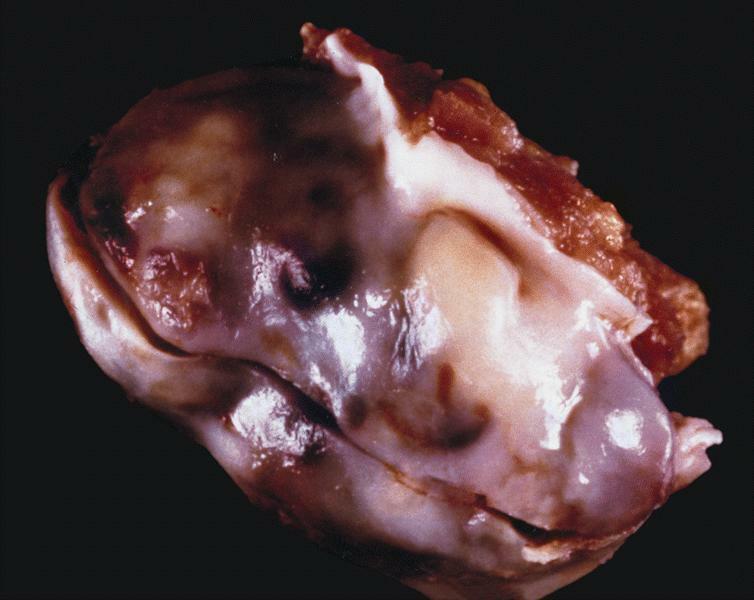 Myxomas are the most common primary tumor of the heart, although they are still rare.� They are distinct from soft tissue myxomas.� The mean patient age is 50 years.� Ninety percent occur in the atria, with 80% occurring on the left side.� They often occur at the fossa ovalis, and may be up to 10 cm in dimension.� Cases associated with Carney�s syndrome typically present at a mean age of 24 years (AJSP 1985;9:53). 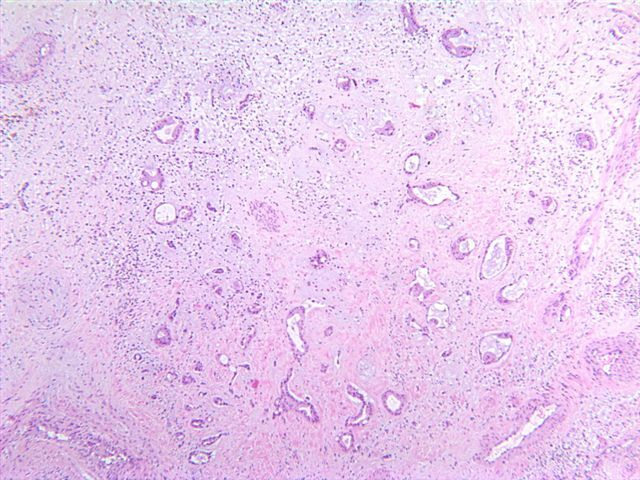 Myxomas often have a gelatinous surface.� The margins may be irregular or smooth.� Histologically, myxomas contain complex structures resembling rings or poorly formed glands, composed of stellate or globular (lepedic) cells with abundant eosinophilic cytoplasm and an indistinct cell border.� The nuclei are oval with open chromatin and indistinct nuclei.� There is a prominent myxoid stroma.� Mitotic activity is variable, and often more prominent near the tumor surface. 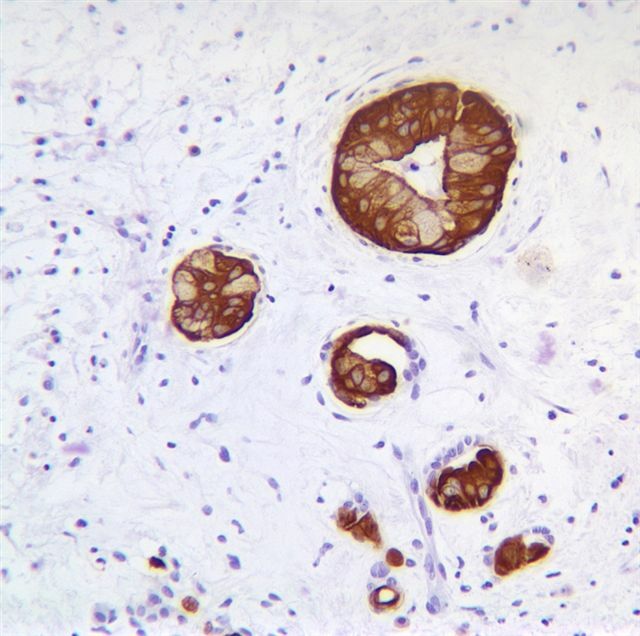 Tumor cells are immunoreactive for CD31, CD34 and calretinin (AJCP 2000;114:754).� Glandular components may be keratin positive, as in this case. 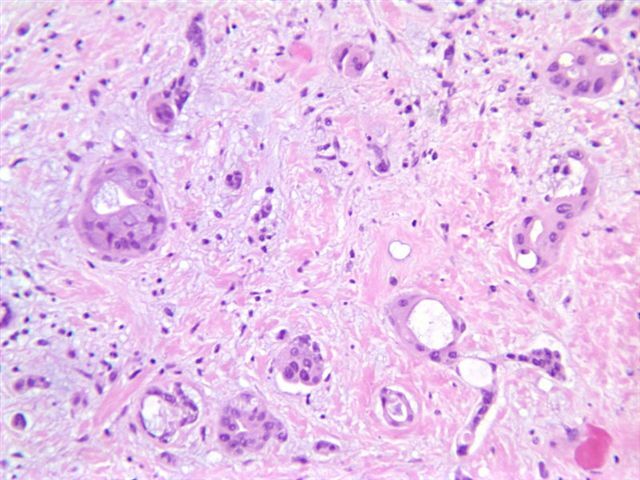 The main differential diagnosis in this case is metastatic carcinoma.� It typically has anaplastic tumor cells with prominent mitotic activity.� Clinical history may also be helpful.� Immunostains are often less helpful, as both tumors may be strongly keratin immunoreactive. 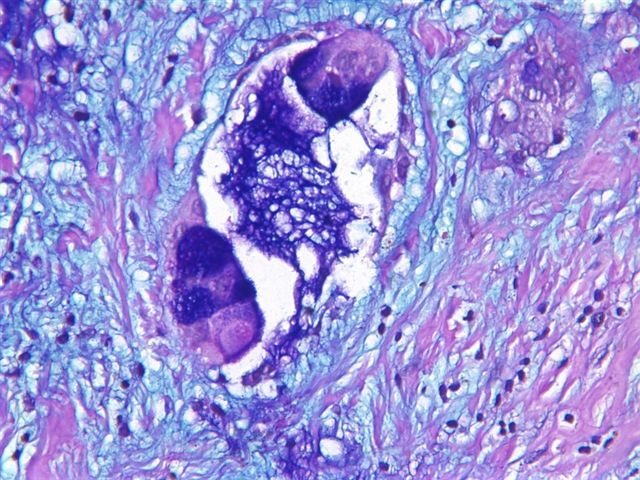 Myxomas are benign, but may cause death via embolization.� Excision is curative in most cases, with only rare recurrence or metastases.